If you’re planning a short trip to namma Chennai (or a staycation right here) and are looking for budget yet nice places to stay, check out these five budget boutique hotels under INR 3000. All properties on this list come with AC, Wi-Fi, hot water and other basic amenities. This boutique hotel in Thiruvanmaiyur is the first entry on this list because of how close it is to the beach (3 minutes away by walk). The rooms and food are what you’d expect from a budget hotel (functional, not extravagant), we love it for the open air restaurant on the top floor that has a clear view of the Bay of Bengal. What’s more, you can enjoy the evening sea breeze there with a glass of beer because their restaurant serves liquor too! Sports fans can catch up on the latest goings-on in their sports bar called the Turf Pub. This hotel is bang in the middle of the city on Radhakrishnan Salai and is the most centrally located hotel on this list. Clarion Chennai has been around for a number of years now and while some of the facilities look dated, it has a charm to it. There’s even a swimming pool on top of the building! We think Clarion Chennai is great for those of you with work in the middle of the city, especially for US visa appointments (the US consulate is just a kilometer away!). Nicknamed Keys, this boutique hotel is in Thiruvanmaiyur just next to the Thiruvanmaiyur bus depot. 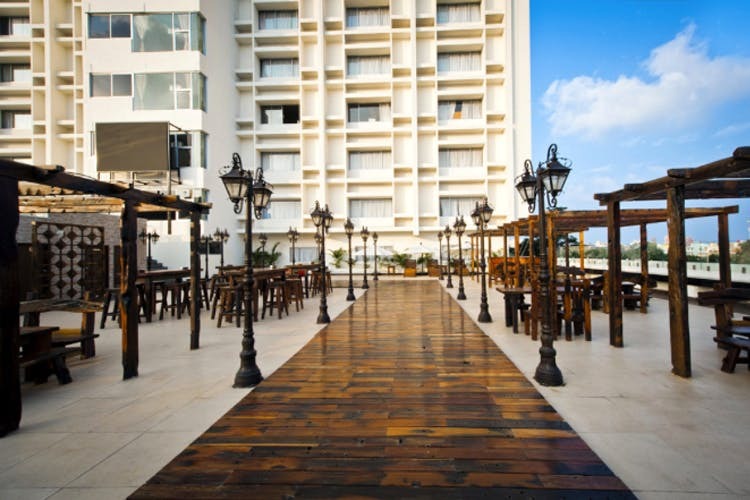 The hotel is well maintained and off late has gained popularity for its rooftop restaurant/bar where football and cricket matches are screened. You may not be able to see the sea but the breeze is still great in the evening and like Eldoris, you can drink on the rooftop restaurant too! We’d be remiss if we didn’t mention the food here, they do unlimited bar food like peanuts, mixture and so on which is great, and have yummy non-veg and veg starters, that are made super quick (chicken lollipop!). Hotel Ramada is one of the older hotels in the city and yet is one of the most frequented. Its service has remained top notch over the years and the property is well maintained even though, like Clarion, the building looks a bit dated. We like Ramada for the large rooms that feel spacious even though you’re paying budget hotel prices. The food, however, is on the pricier side and isn’t up to par with restaurants nearby so if you’re staying here we suggest eating elsewhere. This last entry is a little different from the others. Located in Poes Garden, this central Chennai property is a mansion that’s been turned in to a hotel! We love it for the location and the fact that it looks more like a homestay than a hotel. Each room is super spacious with plenty of beige décor, each bathroom has a tub, and their room on the top most floor has its own balcony! Outside, it has its own lush garden with plenty of open spaces. There is no restaurant here so you’ll have to get your meals outside, that’s fine though because there’s plenty of great places to eat around Poes Garden.